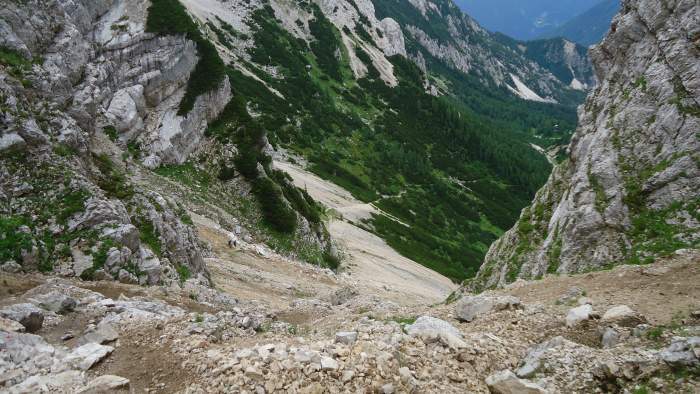 If you plan climbing Mala Mojstrovka the easiest way is from the Vrsic Pass. You can get to the summit in less than 2 hours. Read more here. Mala Mojstrovka as seen from the lower slopes of Prisojnik, from my earlier visit to the area when the weather was perfect. Elevation: 2332 m (7651 ft). Prominence: 721 m (2365 ft). Accommodation and maps: check my Vrsic Pass page. 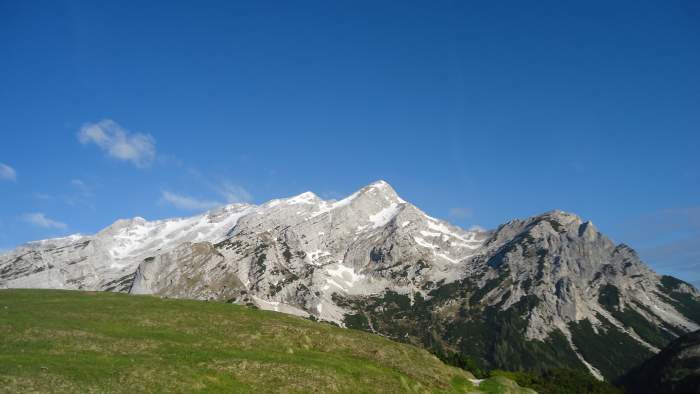 The mountain rises directly above the Vrsic Pass (1611 m) which is a car access place. It is in the north-west direction and clearly visible from the road. In principle, there is plenty of space around to park the car, but this is an incredibly popular place and the Pass can be very crowded. There are no fees here, neither for the Pass nor for the parking. The road to the pass I have described in my another text so no need to repeat it here. 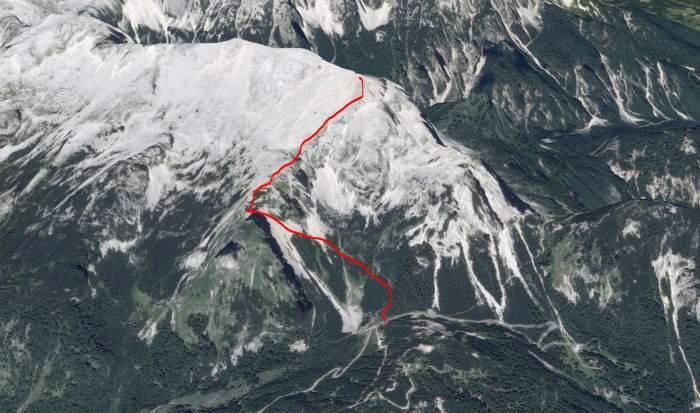 The normal route to the summit from Vrsic Pass. So this is a south approach and the slopes are much milder than the north side, as usual. 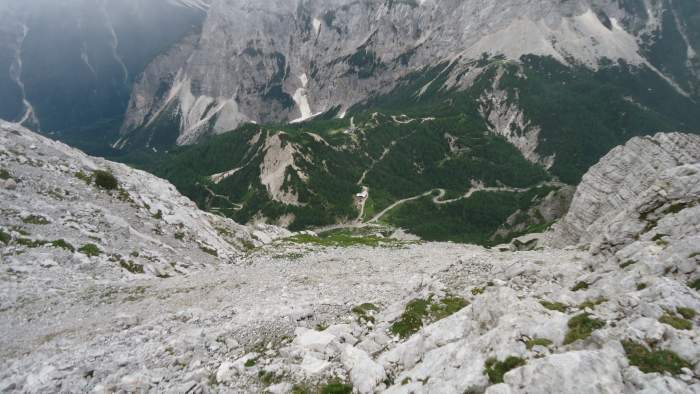 Note that you have 721 meters (2365 ft) to climb from the pass. This is a view back on the lower part of the route. I started at 11:50 and was on the summit at 13:30. The signs at the road will show that you need 2 hours for the tour, so my timing was reasonable. There were a few people on the lower part, I passed them and later realized that they gave up, probably because of the unstable weather. This is the lower section of the ridge which leads to the summit, it is somewhere in the clouds above. It was very windy on the summit and without views most of the time. But I have spent at least 20 minutes there, had something to eat and to rest. It was very windy and called, not a great day for the summit. 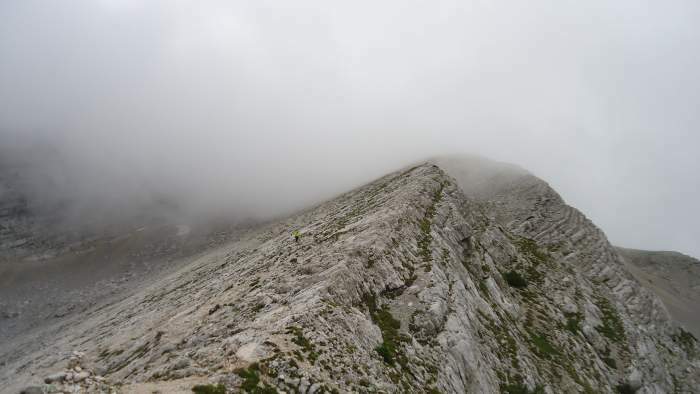 I wanted to continue to Velika Mojstrovka, at one moment I was able to see something that looked like a route in that direction, but it started raining a bit and could not see anything, so reluctantly I had to call it a day and descended the same way back to the pass. This is the actual summit, no cross here. 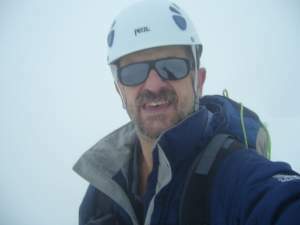 This is a walk-up tour, so you only need ordinary mountaineering boots, and the usual stuff for the Alps which I described in my another text. So as usual, I have had a waterproof layer, my usual daypack, and trekking poles. Currently, I have a pair of Kamperdel poles. No need to carry a helmet or ice axe, in the summertime the normal route is free of snow. But the summertime is short here, if you come in June you will have plenty of snow and you will need the heavy stuff. This was a rare moment when I was able to see Vrsic Pass from the summit. I did not go the ferrata route and cannot provide any first-hand information here, and guessing about a route is not my habit. All I know is what I have seen on YouTube, and this looks like a hard ferrata with vertical cliffs. Also, a group of Checks arrived from the ferrata to the summit when I was there. For several of them this was the first time using the ferrata stuff, this is what they told me. In any case, if you need something from mountaineering tools, check my page with equipment. 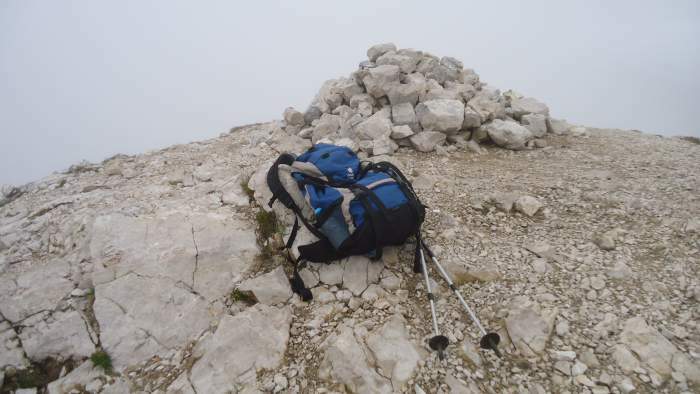 So this was my experience of climbing Mala Mojstrovka, this is a beautiful peak and anybody can climb it in a few hours without any special equipment. If you are lucky to have a clear sky then you will be rewarded with incredible views. I shall be there again, plan to go to Velika Mojstrovka, and also the ferrata route is on my list. If you are in the area, do not miss Prisojnik which is just on the other sides of the Vrsic Pass. Check also my texts about Mangart and Jalovec which are close, and also the text of my solo tour to Jof di Montasio which is on the other side of the border in Italy. Please let me know if you have any detailed knowledge about Mala Mojstrovka or any other mountain around. I have an open invitation for guest authors. Otherwise, use the comment box below. Thank you for reading and have a nice day.